The sheer attention to detail of Formula 1 still blows my mind, despite seeing only a fraction of what goes on in the sport. Attending race meetings and visiting pre-season tests such as at Jerez last week allows me to observe the sport at close quarters, and yet all I am witnessing is the very tip of the iceberg, the showmanship part of an industry that employs thousands of people working all hours of night and day to extract just a tiny amount of extra performance on track. For all the laps being completed at the Spanish track last week, and all those at the next one in Barcelona next week, thousands more were being completed at exactly the same time on various simulators and test rigs back at the factories as teams strived to make sure that their 'virtual' F1 cars match up to the real thing. 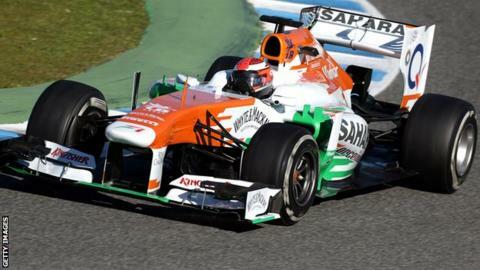 James Rossiter is the test and simulator driver for Force India, and partly because of the fact that no second driver has been confirmed for the 2013 season, he was given the chance to complete some useful running in the race car on Wednesday and Thursday. Rossiter was not at the track on the Friday, but later that evening I discovered why; as I exited the Heathrow customs at 22:30 GMT that night, there he was, meeting up with some team members having spent six hours on the simulator that same day. His task was to ensure that everything learned on track could be transferred to the virtual world and vice versa, and he seemed pleased, if a little tired, that the so-called correlation was indeed very good. Pedro de la Rosa is in a similar role at Ferrari this year, having done the same for McLaren in the past, and I thought it interesting when he admitted Ferrari still have a little way to go on that correlation. It has been an area of weakness for the team. They used to depend on track testing at their own Fiorano facility, and have therefore been a little slower off the mark than rival teams when it comes to simulation. Force India use a McLaren simulator, and Lewis Hamilton made it clear in his first news conference in Spain that his former team hold the advantage over his new employers Mercedes when it comes to such technology. Jenson Button was excited about the new McLaren at the launch, based not only on what he was being told by the team, but also on his own feelings from the simulator. It seems amazing, but he has so much confidence in the sim-world, that he knows the new car will be better than the old one. Any success in that area depends on the ability to convert data into real-time reactive forces. One of the major tasks of the first test for all the teams was to ensure that the data they were receiving off their new cars is accurate and glitch-free. It might not be a glamorous job, but there will have been engineers in Jerez who will have worked long into the early hours, analysing pages and pages of data, perhaps looking for the odd spike in a reading which could indicate a future problem. Imagine poring over information just to see if there's a bizarre reading in the gearbox from 14:30 the previous afternoon when the driver changed down from fourth gear to third. Then you have to determine whether it was a sensor error, or an actual problem in the gearbox. If you miss it, it might cost a race result in six months' time… and all you really want to do is go to bed. It is the same on track; there's work going on which is almost impossible to understand as an outsider. In Jerez, Mercedes driver Nico Rosberg was experimenting with something on Thursday afternoon, as he spent a number of laps leaving his downchanges to the mid-section of Turn One, not a technique he was using in the morning, or indeed later in the day. Perhaps the team were working on brake balance, and did not want the braking zone to be affected by gear changes, or perhaps it was something to do with the Kers power-boost system harvesting energy on deceleration. When asked, Rosberg looked surprised by the question but swept it away without enlightening us. At the same time as all this work is going on behind the scenes, the frontline competitors who have changed teams have their own agenda, and that was again made clear by Hamilton. He is impressing the team with his approach, is keen to understand every aspect of what is going on with the car, and making changes to his driving environment to feel more at home. The Mercedes steering wheel has more, and a greater range of adjustments, on all sorts of parameters than on many other cars; Hamilton's predecessor Michael Schumacher fine-tuned the set-up every lap, and would have had more buttons and switches if possible, always looking for that infinitesimal improvement. Hamilton has already made his preferences known and they are for a more simplified layout, with bigger variations between each setting and fewer individual controls. He wants a setting change to make a difference he can feel, and beyond that he just wants to drive around the situation. In some ways, it is sad that Hamilton will not have the opportunity to see Schumacher at work within the team, because there is no doubt that engineers who worked with the seven-time world champion still wax lyrical about his attention to detail; the kind of detail that they're working with every day (and night). So, as the season approaches and we wait with bated breath for the next stage of winter testing in Barcelona next week, spare a thought for the number crunchers and data downloaders who will be flat out coming to terms with all the knowledge gained at Jerez. The glamour may be at a minimum, but their focus and their ability to find a needle in a haystack could play a winning part in the outcome of the season.